Film Guy Reviews : Topic Of The Day: Are Academy Voters Feeling A Genre-Packed Year? Hello, Bloggers, welcome to another episode of Topic Of The Day. For today's topic, since we are in the midst of awards season, I figured I'd delve into something that really struck me. As I've discussed before in my blog, and others have pointed out, there is one genre that the AMPAS has had a rocky relationship with over the years: sci-fi. Even when Gravity emerged as the big winner a few years ago, winning 7 out of 10 Oscar nominations, they still gave Best Picture to 12 Years A Slave to avoid possible think pieces about how the Academy is racist. But this year, I wonder whether voters will go crazy over the genre films that the studios have in store for them. One is Mad Max: Fury Road. Even if it didn't make all the money in the world, it still has a near perfect rating on Rotten Tomatoes of 97% and it still made $374 million worldwide against a $150m production budget. With its high rating, critics will certainly get behind it and they're just as political as industry voters are. It did win the FIPRESCI Grand Prix Award which is bestowed by the International Federation of Film Critics and which went to films like Amour and Boyhood which went on to be nominated for Best Picture. Also, if you go on Warner Bros'. official awards site, you'll see that they're pushing for it across the board. While this one is more of a long shot, A24 Films is giving a push to one of their summer releases, Ex Machina, which was a sleeper hit, grossing $36 million worldwide against a budget of $15 million. They may have their hands full with Room, but if they push hard enough, it can at least get some tech nods. Because of how small Ex Machina is, I feel that techs are as far as the film will go, but it could still call itself an Oscar-nominated film. Next is The Martian which is currently leading the box office charts and has received high critical praise. When I was listening to the podcast show Indiewire: Screen Talk by Eric Kohn and Anne Thompson recently, they brought up how it could be this year's Argo because of how it is a mainstream crowd pleaser that makes audiences feel good about themselves. They also said that it played very well at its AMPAS screening and that is very key. When Gone Girl had its AMPAS screening, voters greeted it with a shrug and that was like a foreshadowing of how it was treated on Nomination Day. So if voters like it, that's a pretty big deal. Lastly, I'll go into a little movie called Star Wars: The Force Awakens. This may seem crazy, but hear me out. Now, we're all pretty aware that it'll be a box office behemoth as it is already breaking pre-ticket sales records. But if it receives positive word of mouth from critics, then I could see it having a strong showing at the Oscars because it has J.J. Abrams behind it who almost got voters to recognize fanboy fare with Star Trek which scored a Producers Guild nomination as well as a Writers Guild nod for Best Adapted Screenplay. But over the years, the Star Wars franchise has been more embraced. The first one won 7 out of about 10 nominations and the subsequent 2 films still won technical awards. 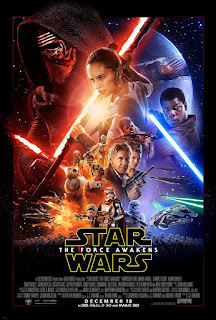 Much like the first Star Wars, Gravity, and even Avatar which, coincidentally came out on the same date, December 18th, Star Wars: The Force Awakens will likely be an event that will bring the masses into the theaters and sometimes, voters do like to embrace that. But what do you guys think? Do you feel that voters will go crazy and recognize any of these films for major categories? I would love to hear your thoughts in the comments section. Thanks for reading!